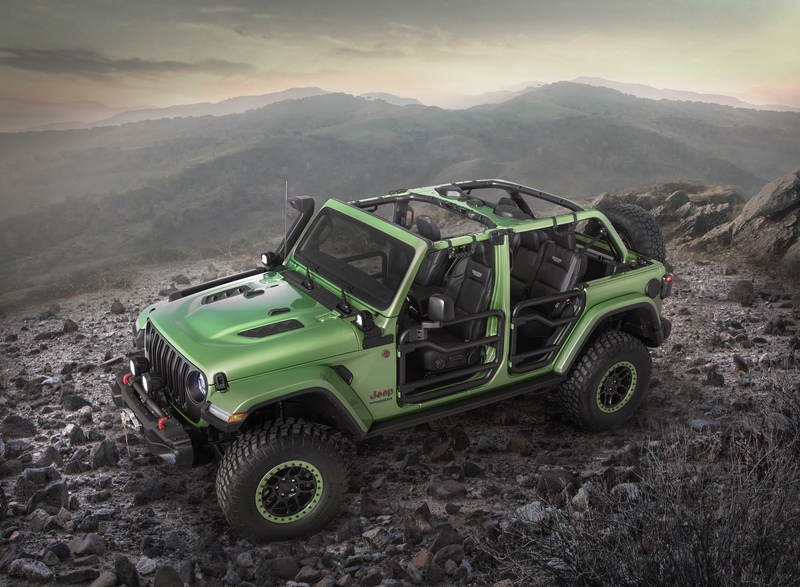 The first of what is sure to be many special editions for the new JL Wrangler is the 2018 MOAB edition. Debuting first in 2013 on the JK Wrangler, this year’s JL MOAB is also based on the Sahara trim. The MOAB comes standard with Rubicon’s hood, steel bumpers, and rock sliders and exclusive to the MOAB; BF Goodrich KM mud terrain tires. The 2018 JL MOAB Wrangler, unlike the previous JK MOABs will not come with an available rear locking differential. The JL MOAB will, however, come with a standard trac-lok limited slip rear differential. LED lights and Color match hard top are standard on the MOAB, dual tops and the sky one touch power top are optional. Wrangler MOAB edition will be available in nine colors: Granite Crystal, Billet Silver, Punk’n Metallic, Mojito!, Black, Bright White, Sting Gray, Ocean Blue Metallic and Firecracker Red.